Three of my father’s six siblings, Hugh, Gladys and Anna Cleage. This article is from one of the Detroit daily papers and is undated, but I would place it in the early 1940s. Years later when I was talking about this photo with my aunt Anna, she said that the story was wrong and that actually she came in third and Gladys won the race. She remembered taking an early lead in the race but soon falling behind as Gladys easily over took her. They learned to skate at the Northwestern High School skating rink, which was a few blocks from their home on Scotten. When my sister and I were in high school at Northwestern in the early 1960s we skated at the same rink. 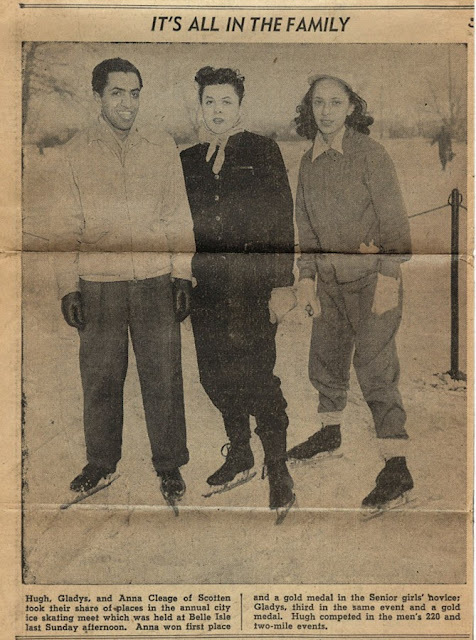 We got racing skates because Hugh and Gladys were so cool skating on the Lagoon at Belle Isle, but we were never gold medal material. The old Northwestern High School is no longer there. It was torn down and a new school was build where the skating rink used to be. Cabral, Ife, Tulani and James skating. In 1986 my husband and I moved to Idlewild, Michigan with our children. We lived on Idlewild Lake. When it was frozen we skated right in front of the house. Hugh and Gladys could still skate circles around us. During the summer when Gladys and I walked around the Lake, people from Detroit’s Old West Side would stop us to ask if she was the skating champion. She was in her early 60s. This week I wish I had some skates. It would make it so much easier to get around frozen Atlanta. 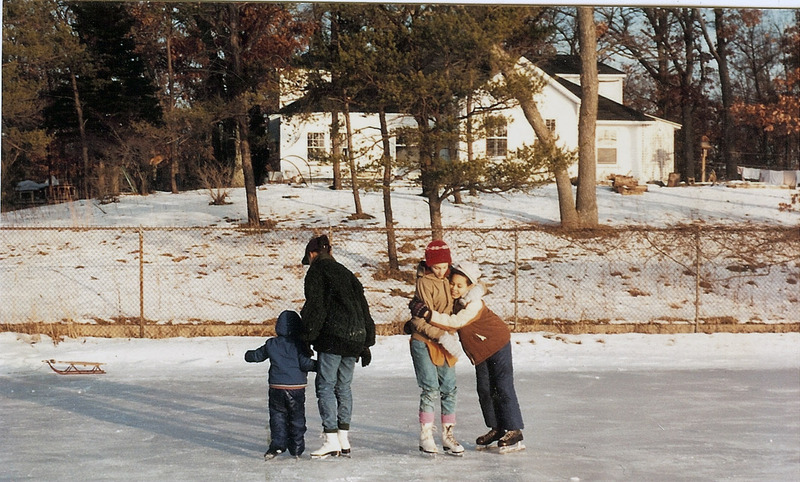 Above is a picture of four of my children skating on Idlewild Lake about 1990. To see more Sepia Saturday offerings click here. I too enjoyed skating at Northwestern and at Belle Isle. No way could I still skate in my 60's. My hat is off to Gladys. A champion post! I've never tried skating – we don't get the weather for it in the UK. I have enough trouble trying to stand up on the ice on our drive in the cold weather this year. I tried to iceskate once and was not able to do it. We could roller skate up a storm but not on ice. This was an interesting post and some great pictures. Great job. Oh ice skating is still very popular here where many play hockey. Jerry, can do that. I grew up on roller skates but never did the ice skating and I'm not going to try it now! Lovely photo and interesting tale about them. I always admire watching ice skaters and their grace. We see the news about the snow storms in the south and had considered heading south but we are better off waiting out the snow here at home in it! keeping it in the family and keeping it real! Very nice! one last thought, it seems ice skating is almost a lost art around here anymore…maybe our winters have been too cold….or families need a rest from too much soccer …but I wish it would spring back with much more attendance again! Thanks for sharing this! I used to roller skate a lot when I was young. Street skating when I was elementary school age. Summer of 1967 I was 20 and nursing a broken heart. I spent a lot of time skating at a rink next door to my uncle's cottage in Idlewild. Sometimes my cousins and I would go around to the "Island" where the big clubhouse/skating rink was. It had fallen on hard times and we had to jump over the holes in the floor in some spots. Needless to say it was torn down soon after. My grandchildren are not growing up skating here in atlanta. Hope the northern branch of the family is keeping up the tradition but I think Pat is right, people don't skate like they used to. Your aunt must have been well-known to be remembered so many years later! Perhaps it was also a small community. Do you look like your Aunt Anna? I almost think so from some of the earlier photos of yourself that you've posted. A wonderful post. Which, incidentally, I read after returning home from Sheffield where I was watching my son play Ice Hockey for his university team. I think I have only ever skated twice in my life, but for a moment or two as I watched them fly around the rink, I too wanted some skates. wonderful post….makes be want to don a pair of skates and hit the ice. i've lived in the NORTH (new england and now cleveland) since 1981 and you'd think i'd have tried…..
old dogs, new tricks, hmmmmm???????????????? Nancy, the old west side of Detroit was a small community within a big city and there were quite a few of them who had cottages in Idlewild which is an historic black resort in Lake County MI. after asking about her championship skating they would often tell us her father delivered them. Back when segregation was the order of the day, both north and south, Idlewild was one of a very places around the country where African Americans could go and enjoy a respite from life in the city. Now there are still those who go to Idlewild for the fishing, swimming, etc. but back in the 1950s and before there were nightclubs with big name acts. Not only wonderful family history, but the history of our country, too. So interesting learning about Idlewild! Nancy, I never really thought I looked like Anna but I’ll have to look again now. I look a lot like my father. How sad that Gladys didn't get her due. We skated every winter in Chicago when I was young. Just before I read your post I had been looking at pictures of my parents skating at the University of Chicago. Gladys got the gold medal and apparently everybody knew she was the champ,except the newspaper. I don't think she minded. That is neat that they remembered the name of the champion ice skater. We use to skate on our old farm pond. It was always so rough and made scary noises like it was going to break up. lovely heritage to see one generation after the other enjoying the same sport. i saw on the news a guy skating on the street in atlanta. that was funny, on tv!! but i sympathise, as we've often had this problem here, but not this winter. the winter here so far has been an odd one. Kristin, wonderful blog. I love the synchronicity of the two photos in this post. I look forward to browsing here often. Thanks for leaving a comment on my blog, which allowed me to find you! As cold as it is… This was heartwarming. Loved the old photos. History of knowing Idlewild did exists. Love how you incorporate your stories with photos for just the occasion. Great memories! Funnily Enough, the one & only time I have ever been skating was on a frozen lake in New England. My Best Wishes to You & Yours for 2018.